Palm tree-lined promenades, breathtaking views, incredible restaurants, exquisite artwork and pulsing nightlife await visitors to Palma de Mallorca. Located on the southern shores of Majorca, the capital city is a multicultural treasure with a fascinating history and a promising future. Palma de Mallorca welcomes those on holiday with just the right amount of energy, and a vibe that is less touristic than Ibiza but much more traditional. The city has blossomed from a once low-profile destination to become a favourite for those seeking an exceptional island getaway. On the western side of Palma de Mallorca is Cala Major, which is a sparkling stretch of sand about 250 metres long. The beach is roughly about four kilometres from the city centre and is home to the art museum that is Fundació Pilar i Joan Miro. Also in Cala Major is the Marivent Palace, which is used as a holiday residence to the Spanish royal family. Cala Major Beach is protected by jetties, which help to keep the water calmer and clearer. Another beach in the area is Playa de Palma, which is located to the east. The 4-5 kilometre beach is quite famous and well-known, and is therefore more crowded, particularly in summer months. Chic boutiques, high-rise hotels and restaurants line the beach. Ca'n Pere Antoni Beach is the beach closest to Palma City Centre, sitting just two kilometres away. It is an urban beach that borders the wide seafront promenade. The tree-lined avenue serves as the cultural centre of the city and is the heart of the local social scene. The best shops in Palma are situated along this pedestrian-only boulevard, along with traditional yet cool tapas and coffee bars. Grand architecture lines the main boulevards and much of the inner ring is free of traffic, ensuring visitors a peaceful & relaxed stroll. The Cathedral of Santa Maria of Palma is a gothic masterpiece, and a stunning centerpiece of the waterfront and the city. Also known as La Seu, the grand structure looks out on to the Mediterranean Sea. Dazzling glass filters the sunlight, giving the interior a coloured glow when the sun is as its brightest. The rose window of the Cathedral is the largest of all gothic cathedrals in Europe. The cathedral is located in the heart of Palma's old town, and is quite easy to find. During the summer holidays, there is usually an outdoor cinema in El Parc de la Mar where visitors are able to watch movies, sometimes in the original version. 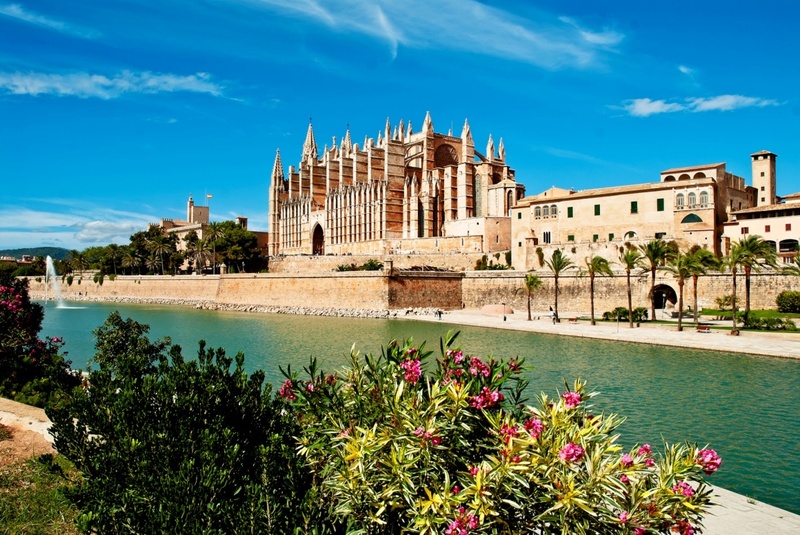 Palma Cathedral is a must-see if you are visiting the city. This classic-style mercantile exchange dates all the way back to the Middle Ages. The main structure consists of a walled marketplace that is often used for interesting exhibitions and fairs. Surrounding the marketplace is an entire neighbourhood pulsing with life and things to do. Visitors can wander the streets or stop for a drink at a pretty sidewalk cafe whilst considering dinner & drinks plans for the evening; jazz clubs and bars have transformed the area into a popular night time hot-spot. The Es Balaurd Museum of Modern and Contemporary Art is located in the perimeter of the Sant Pere Bastion, which is the Renaissance Era fortress wall that formerly surrounded Palma. The many galleries are supplemented by a fine restaurant. The Bellver Castle imposes itself on the city from a hill northwest of Palma. Find information about selected Hotels, apartments and rooms in Palma de Mallorca to choose the perfect place for your accommodation.